There are a number of reasons to doubt this statement. For one, it seems unlikely they could pull together an in-person demonstration of the prototype when they had just insisted new photos or videos of the technology in action would be impossible. For another, what sane business person would leave $360k CAD in preorders on the table? It’s not clear whether GTX is stepping away voluntarily or under pressure from Kickstarter, but by doing so now, 2 days before the end of the campaign, the more than 2,500 backers are guaranteed to keep their money. My congratulations to the backers for asking hard questions and not settling for anything short of direct answers. They may not get their LUCI, but they can take pleasure in the defensive petulance of this letter, a hallmark of a scoundrel cornered. This entry was posted on Monday, November 11th, 2013 at 10:05 pm by OccamsChainsaw	and is filed under Kickstarter Campaigns. You can follow any comments to this entry through the RSS 2.0 feed. You can leave a comment, or trackback. Here, Here to Occam and Choof on this one. It just stinks top to bottom. Especially the fact that some investor just swooped in at the last second deciding to offer terms just too good to be true on the order of multiple $100’s in the last minute. No deal like this could ever be concluded in this amount of time and no investor of this magnitude would ever offer this much cash with too good to be true terms. 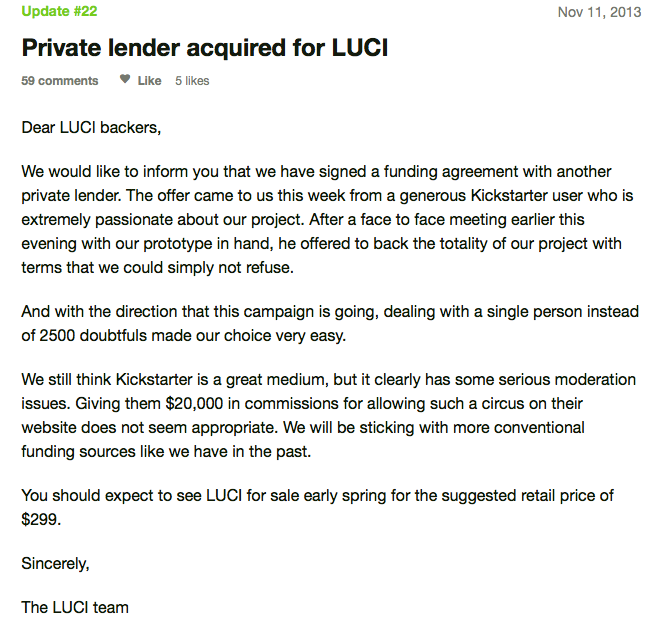 Even terms that Luci founders would be moderately happy with at orders of magnitude lower investment would not leave them with such a happy disposition. This stinks top to bottom.